Many charitable organizations are selling their wares on eBay to raise money for their fine work. You can get some rare and unusual items here, such as the annual NBC Today Show Green Room autograph book. This one-of-a-kind book has signatures and notes from the famous guests of the Today Show. One of these Green Room books sold for $87,500! The super-hottest auction is the annual lunch with Warren Buffet (the CEO of Berkshire Hathaway); in 2012 it raised $3,456,789 — bidding almost tripled in the last seconds! eBay partnered with a leader in online charitable auctions, MissionFish, which has been helping organizations turn donations into cash through online auctions since 2000. MissionFish works with eBay sellers to raise money for nonprofit organizations. When you list an item on eBay, you can choose a nonprofit from a certified list and designate a percentage of the proceeds (from 20 to 100%) to donate. The item appears in the search results with a Charity Auction icon. When you go to the item page, you’ll see the name of the nonprofit, some information about it, and the percentage of the final bid that the seller is donating. 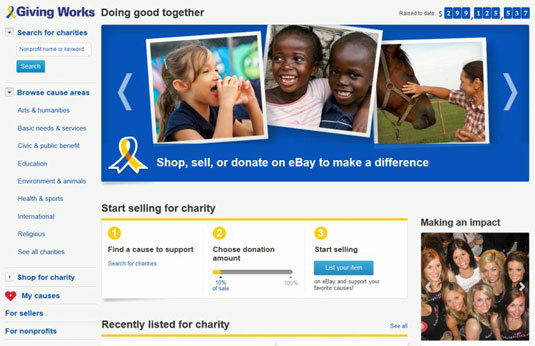 You can search eBay for your favorite nonprofits by name.